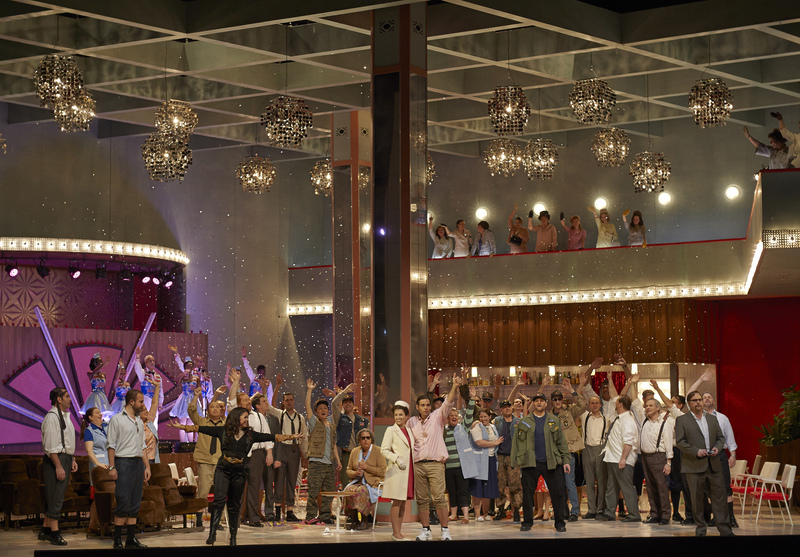 The Canadian Opera Company’s current repertory program is one of its most delightful ever, beginning with Mozart’s fairly harmless Cosi fan tutte and raised to wonderful heights by Verdi’s magnificent Masked Ball. I don’t plan on wasting much time talking about Cosi since, at 3 hours and 30 minutes, it’s already taken far more than it deserves (judging by the speed with which the audience hit the coat check the night I attended, there seems to be a consensus on this matter). Please don’t get me wrong, this is not a bad production. It’s just truly truly silly and entirely too long to pull off being so thoroughly silly. I whole-heartedly commend director Atom Egoyan on the sheer effort he’s put into making it not silly, but silly it is nevertheless. 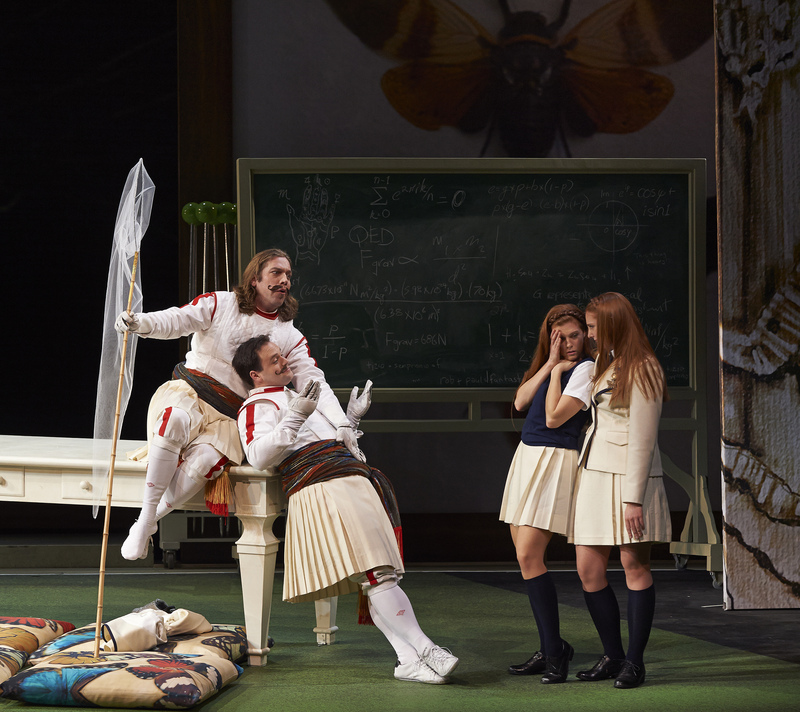 Egoyan gave great thought to the opera’s subtitle “The School for Lovers” and thus gives Cosi a fun, contemporary upgrade that is a charming aesthetic while reinforcing the youthfulness of the characters (and thus excusing some of their folly). He also makes a bold attempt at saving the female characters from their own idiotic existence. By giving them a bit of stage business at the beginning and writing a detailed director’s note, Egoyan attempts to convince the audience that Fiordiligi and Dorabella are in on the faithfulness test the whole time. Bravo, a lovely idea, what wonders it will do for the terribly conceived female characters… if only there was even an inch of room in the libretto for such a choice. Alas, what’s interesting on paper is completely lost on stage and we’re left with the stupid story of any old Cosi fan tutte (let’s face it, it’s likely just not an update-able text; let’s leave it be and choose other things from now on, yes?). A charismatic and vocally sumptuous Guglielmo (Robert Gleadow) helps ease the tedium while Wallis Giunta’s lovely mezzo and Isla Fisher-esque charm make her Dorabella a winner, but Paul Appleby leaves something to be desired as a tentative Ferrando. Also, if you would like to be taken seriously, best not lean on a butterfly motif; they’re everywhere and they make the production look, well, silly. 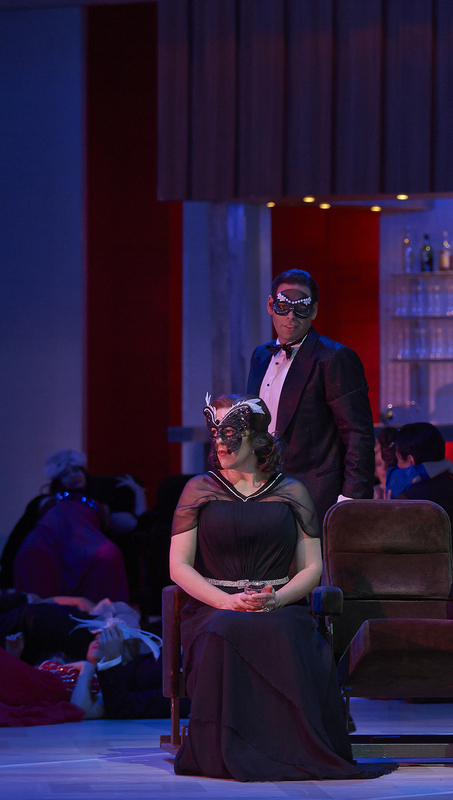 But there is hope yet, because the middling Cosi is paired with what is now my favourite opera- A Masked Ball. There is nothing quite like taking your seat somewhat skeptical and standing for curtain call with a new appreciation for an entire theatrical medium. It happened with ballet when I saw the National’s 2010 production of Onegin, and it happened again on Saturday night. In my time reviewing the COC, I’ve been able to intellectually appreciate many of their best productions (and revile the bad ones; I’m talking to you, Salome). There have been brilliant performances (Anna Christy in Lucia di Lammermoor comes to mind) and some standout moments (the end of Dialogue des Carmelites was extraordinary), but I’ve never been able to call myself an opera fan. I don’t like how rarely I get to see familiar performers; I can’t stand how adamantly many of those unfamiliar performers refuse to actually act; it drives me crazy that so many opera directors either go outlandish or boring but rarely go thoughtful with their interpretation. But, mostly, I hate opera stories. I know you’re not supposed to say that, but they’re just bad. I don’t care that (insert soprano here) is being forced to marry (insert evil Duke/Count here), I don’t buy the love at first sight nonsense or simplistic revenge plots or anything that could be summed up with the phrase “it was all one big misunderstanding”. You have to have a pretty damn beautiful voice to make me happy to listen to you complain for 4 hours that life is hard and love hurts, leading up to your eventual suicide (all translated into unfathomably cheesy English by the handy surtitle people doing their best with the cheesy Italian or German libretto). It’s just not a medium I’ve ever fully appreciated beyond the intellectual exercise of it all. Then came Saturday, a night I’m pretty sure might have just changed my relationship to opera forever. A Masked Ball was the first full-length opera that’s ever had me hooked from curtain up to curtain down (the only other thing I enjoyed so thoroughly was 2012’s one act Gianni Schicchi). It was the first opera to ever surprise me with its depth of storytelling, the first to really impress me as a whole production in any realm beyond vocal technique and design budget. Interestingly, the design (the one area where the COC always impresses) is the only thing about A Masked Ball that is actually bad (I would have liked more power and mystique from Elena Manistina’s Ulrica and a more full-bodied richness from Roland Wood’s act one vocals, but that’s just splitting hairs). I have no idea what set designer Barbara Ehnes was going for with her tacky community centre version of a hotel ballroom but it’s atrocious (to the point where it made the old ladies at intermission titter with disapproval). Giant pillars take over centre stage as though they were load-bearing and non-negotiable while appallingly ugly chandeliers hang from the ceiling like steel wool Christmas ornaments. They lower for the second act to, apparently, simulate tree tops but the action just appears to be taking place in the same ugly room but with the lights dimmed. The governor is throwing a ball, surely he can afford to rent a place more opulent than the local YMCA. That is, however, the end of my bellyaching because, in literally every other sense, the production is fabulous. Directors Jossi Wieler and Sergio Morabito, like Egoyan, update their story and work in some business of their own devising to try and flesh out the action. Unlike Egoyan, however, they know the limitations of their text and the addition of a savvy first lady character adds great effect without straining believability. The new character is completely silent and rarely seen but she deepens Riccardo’s inner conflict, heightens the stakes, and moves the plot forward- a brilliant directorial trick. Wieler and Morabito also add smart, character-defining details like Riccardo and Renato’s special handshake (it helps sell the crucial friendship, creates a laugh where there wasn’t one, and highlights a key plot point). They’ve chosen a fresh time period that informs the action (the height of American segregation); they’ve brought new levels to a fifth business character by making Oscar actually female rather than a pants role sung by a coloratura; they’ve blocked in key moments that could easily go unnoticed but provide a big payoff to anyone who looks beyond the foreground action (my favourite: the subtly threatening arm Tom drapes over Renato’s son when he’s used as collateral). Perhaps most impressively and definitely most importantly, they elicit genuine emotional and comedic performances from their actors (yes, I said actors; the COC always delivers great singers but rarely a decent actor). The excellent cast is headlined by two 2013 My Theatre Award nominees, Dimitri Pittas and Adrianne Pieczonka, who have become My Theatre favourites for good reason. As dramatic actors, they both are consistently head and shoulders above most of their colleagues (Pittas even shows off some impressive comic timing here, a surprising skill that doesn’t get called on much in the tragic world of operatic leading men) and, vocally, I can think of few people I’d rather listen to. Pittas anchors the opera as the good and gentle governor Riccardo, the first notes from his penetrating tenor signalling the calibre of what’s to come (note: Riccardo doesn’t actually open the show, but Pittas’ vocal entrance is when A Masked Ball caught me. It would be 3 hours before I was released). My feelings about Pieczonka, meanwhile, can be summed up by the fact that I’m still recovering from that outrageous act three aria. While Pittas and Pieczonka are the highlights, theirs are far from the only great performances. Evan Boyer stands out as the murderous Samuel, his rumbling bass leading the strong chorus of conspirators with gravitas and superb staccato while Simone Osborne’s Oscar delightfully serves as the ebullient emcee of the grand affair (unfortunate pun very much intended). 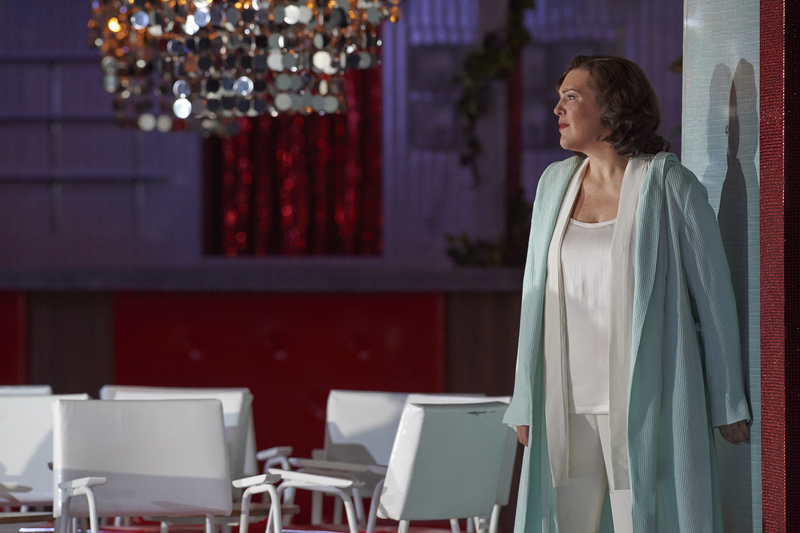 In arguably the opera’s most complicated dramatic role, Roland Wood musters an excellently conflicted performance and recovers enough of Renato’s humanity by the close of act three to make the tragic ending optimally poignant. The fact that the performers have so much to work with is, above all else, what makes A Masked Ball great. Verdi’s score is sensational, of course, but it’s the story itself that I want to focus on. The opera’s complicated history muddles the allocation of credit for the strength of the tale but, through a combination of historical fact and two librettists working on two different opera versions, the story of the assassination of a beloved king ended up in fine form. For starters, it gives us a hero worth rooting for in Riccardo, a fair and honourable leader who is not just reported as such but actually proves his worth by standing up to his advisors and saving Ulrica from banishment in act one (his stealthy promotion of an overlooked soldier seals the deal on Riccardo’s merit). The story then calls said good guy credibility into question as Riccardo verges on an affair with the wife of his best friend, Renato. Right there, you have a character construction far more complicated than the hero vs. villain paradigm of almost every other opera I’ve seen. A looming murder plot reveals the self-sacrificial love Renato has for Riccardo, the way he comes to his rescue no questions asked in act two confirms it, and thus a character who might have been an antagonist is as much a hero and a victim as a villain. Riccardo, then, is not only confronted with the moral implications of loving another man’s wife but with the personal ramifications of breaking the heart of a man who would give his own life to save Riccardo’s. The love affair itself reflects such complication- the intimacy of Riccardo and Renato’s friendship lends credibility to a long-standing, unspoken love between Riccardo and Amelia (a far more realistic construction than most forbidden operatic love affairs); the tentativeness of the confession of said love reveals the guilt both parties feel over their emotional betrayal of Renato; the fact that said betrayal is emotional rather than physical adds dimension to the fates of all three characters, and the way Riccardo plans to resolve his part in it heartbreakingly confirms everything the audience believed about him from the moment he saved Ulrica. Before the titular ball even begins, more genuine human tragedy has played out on the Masked Ball stage than in any opera I’ve ever seen. There’s an honesty to it that one doesn’t usually see in flashy mediums, a complicated intimacy. Without that- even with Wieler and Morabito, Pittas and Pieczonka- A Masked Ball couldn’t be what it is, the opera that changed opera for me.